Although not usually greenhouse pests, beetles can be found feeding on plants in outdoor production and retail yards, cut flower fields and customer's gardens. Beetles are a large group of insects characterized by hardened forewings. Both adults and larvae have chewing mouthparts that cause damage to a wide range of plants. Leaf feeding beetles such as lily leaf beetles and scarab beetles are important pests in herbaceous perennial production. Other damaging beetles include tortoise beetles, flea beetles, various spotted and striped cucumber beetles, larvae of click beetles (wireworms), and blister beetles. During weekly plant inspections, look for chewed leaves, or pinholes from flea beetle feeding. The lily leaf beetle (Liloceris lilii) was introduced into the U.S. in 1992, and has since spread throughout New England. Adults are 1/4 to 3/8 inch (6.3 to 9.5 cm) long, bright scarlet-red in color, with black legs, head, and antennae. Larvae are orange, brown, or yellow. They resemble a fragment of soil as they transport their excrement on their backs. Both adults and larvae feed on Fritillaria, Lilium, Polygonatum, and Nicotiana. Overwintering adult beetles emerge from the soil in early spring. Females lay up to 250 eggs (over two growing seasons) on the underside of lily leaves. Larvae, which feed for approximately two weeks before entering the soil to pupate, cause most of the damage to plants. Adults emerge from pupae in 3 to 4 weeks and feed on plants until fall. Adults overwinter in soil and plant debris. Insect growth regulators may be effective in killing the early instar larvae. However, applications must be performed before the larvae start covering themselves with their excrement. 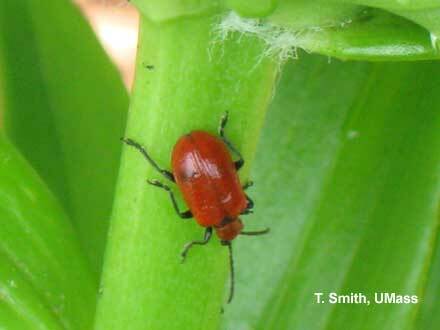 For more information see the fact sheet Lily Leaf Beetle. Golden Tortoise Beetles adults (Metriona bicolor) are shiny, golden beetles, less than 1/4 inch (6.3 cm) long with thin margins that extend out from their body and a shield-like structure covering their head. They are sometimes mistaken for ladybird beetles and may also be known as;goldbugs;. Tortoise beetles overwinter as adults. There is one generation a year. During late spring and early summer, adults lay their eggs on leaves. Eggs hatch into yellowish to oval brown, broad, spiny flattened larvae that use their rear spines to hold debris and excrement over their back. Both adults and larvae can feed upon plants in the morning glory family (Convulvulaceae) ( Ipomoea sp) causing distinct round circular holes. Contact insecticides labeled for leaf feeding beetles may be applied in production where the damage may be unsightly. Scarab beetles are large brightly colored beetles with distinctive club antennae. Asiatic garden beetles, Oriental beetles and Japanese beetles feed on many different herbaceous perennials, woody ornamentals, and vegetables. However, another scarab beetle, European chafer adults are not foliage feeders. The fleshly legless larvae, known as white grubs, develop on the roots of many different plants. The identification of the particular grub species is important because the effectiveness of chemical controls and beneficial nematodes against white grubs varies according to species. Larvae can be identified to species by the pattern of hairs (rasters) on the tip of their rear end. See the fact sheet Grub Identification for more information. Asiatic garden beetle adults (Maladera castanea) are about 3/8 inch long (9.5 cm) and cinnamon-brown in color. They are often found near the roots of plants when weeding. Asiatic garden beetles feed at night on a variety of plant material including Aquilegia, Aster, Chrysanthemum, Dahlia, Delphinium, Helianthus, Heuchera, Phlox, Physostegia, Rosa, Rudbeckia, Salvia and Zinnia. Their nighttime feeding causes c-shaped notches on the edges of leaves. During the day, adults burrow into mulch or soil or can be found under pots. Immature white grubs feed on the roots of grasses and flowering plants. Asiatic garden beetles overwinter as grubs in the soil and adults emerge the following summer (mid-July to mid-August). There is one generation a year. Contact insecticides may be applied against the adults. Repeat applications may be needed. Grubs can be managed in grassy areas. Oriental beetle adults (Anomala orientalis) are about 1/2 inch (12.6 cm.) long, straw-colored or dark brown with dark markings on their wing covers. Adults emerge from the soil in mid-June and are present until August. They are active during the day and night. Adults do very little foliage feeding. The white grubs feed on the roots of herbaceous perennials, and woody ornamentals. Adult Japanese beetles (Popillia japonica) are from 1/3 to 1/2 inch ( 8.4 - 12.6 cm) long, metallic green with copper colored wing covers and white patches of hair near the end of the abdomen. Adults can feed during the day many different woody and ornamental herbaceous plants. Adults emerge from the soil in June and July and feed for about 30-45 days. Eggs are laid in the soil in grassy areas and hatch into white, c-shaped grubs that feed on turf grass roots. Japanese beetles overwinter as grubs in the soil below the frost line. There is one generation per year. Japanese beetles are extremely mobile, and once feeding begins, the pests emit feeding or aggregation pheromones attracting other beetles to the same location. Look for feeding between the leaf veins (called skeletonization) on favored hosts. Contact insecticides can be applied as soon as the adult beetles are observed. Many of the contact insecticides may be harmful to bees, predatory mites and insects. Apply grub control to larvae in grassy areas surrounding the production areas. See fact sheet "Current Insecticide Approaches for White Grub Control" from the UMass Extension Turf Program. Good weed control in and around production areas helps to eliminate potential food sources. Shade cloth can be used to exclude adults from hoop houses. 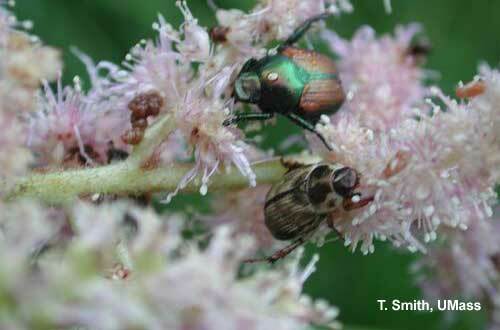 Japanese beetles are strong fliers. Japanese beetle traps attract adult beetles, but only increases their feeding damage so are not recommended. The female winsome fly (Isocheta aldrichii) is a natural enemy of adult Japanese beetles and will parasitize them. Look for the distinct white eggs on the thorax of adult beetles. The spring Tiphia (Tiphia vernalis) is a parasitic wasp that attacks Japanese beetle and Oriental Beetle grubs. A recent survey in CT, found that the spring Tiphia wasps are widely distributed. Beneficial nematodes (Heterorhabditis sp.) are commercially available for use against white grub larvae. Scarab beetle species vary in their susceptibility to infection and white grubs also have some defenses against nematode infection. Adapted from Vegetable Notes, July 8, 2010, UMass Extension.